The most famous and also the busiest of Tuscany's natural hot springs lie close to Montemerano in the southern tip of the region. 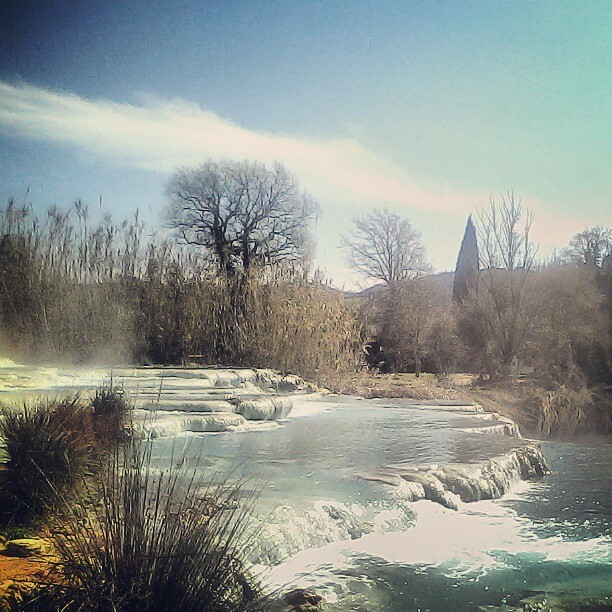 Saturnia's wild pools even have their own facebook page (with more than 6000 fans last time I've checked). Whilst Saturnia wasn't quite an insider's tip when I first soaked there in the 90s, it definitely has become even better known in the 21st century - at least to judge from the recent parking area and the outdoor coffee bar right on the footpath which leads down to the natural springs. Saturnia's rock pools are popular for a reason. Quite apart of the history telling us about Etruscans bathing there and Romans giving the thermal bath its Saturnian name, the wild Cascate del Mulino (the waterfalls of the mill) are a stunning sight in the midst of a tranquil little valley. And the mineral properties of the warm water are supposed to sort out (or at least calm down) many an aching bone, persistent cough or ailment of the skin. 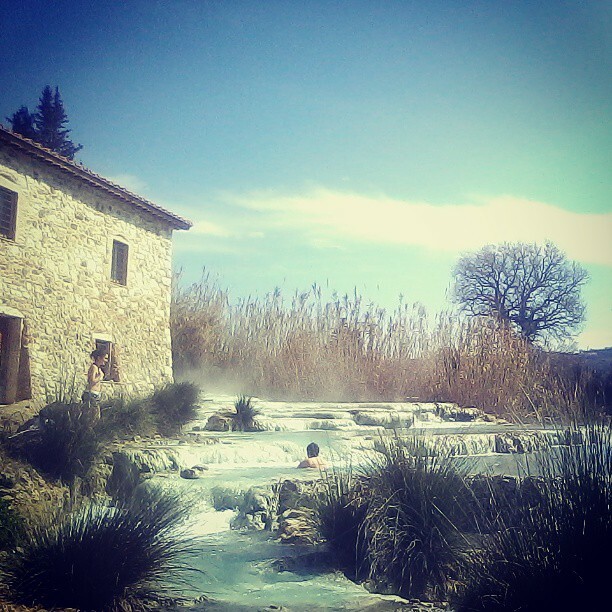 But whatever the possible medical benefit - a dip in Saturnia's natural hot springs is no doubt bliss for the soul! First one in. Nothing over an early morning dip. WHEN TO GO? 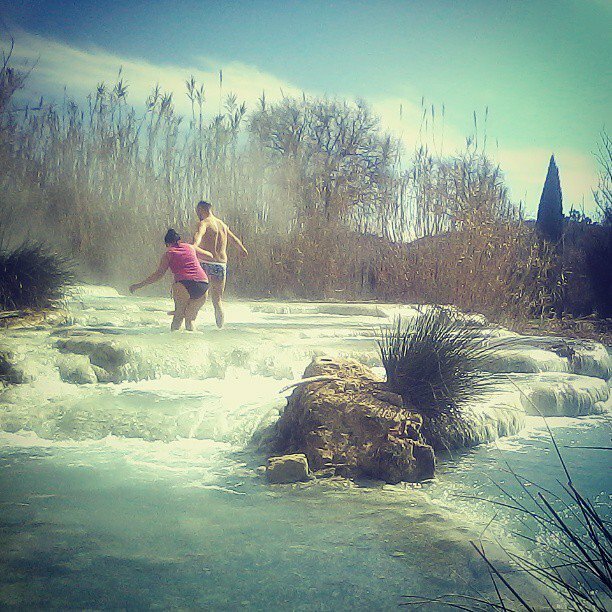 Saturnia is best visited in spring or autumn. On very cold winter days, the 37 degrees of the water can feel a little 'cool' (the Petriolo natural hot springs between Siena and Grosseto may be a safer bet on an icy day with its waters measuring a full 43 degrees). Try early morning or lunch hour for a relaxing bath, as these are often the less busy slots, and - if you can - avoid the weekend. If you happen to come by in the summer, a night swim may be your best option. 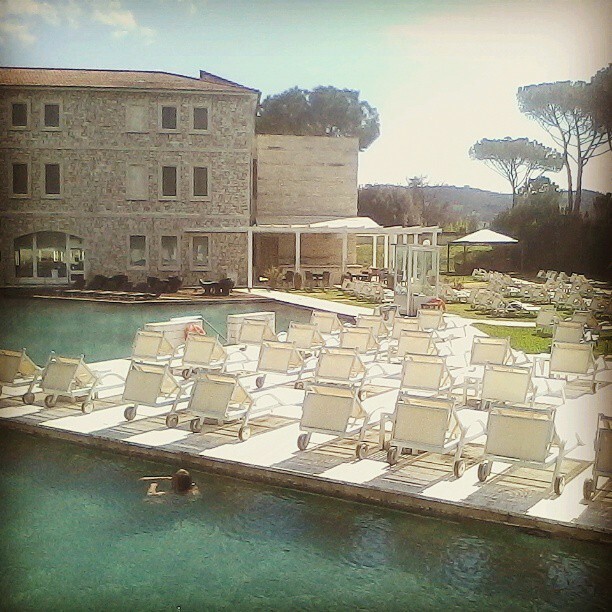 If things look too busy at the rock pools head on to the Terme di Saturnia resort. Entrance to the thermal baths is a short drive up the road (not via the gate that leads to the hotel and golf court but a bit further uphill). A dip here doesn't come for free (full day ticket 22€), but you'll get access to four pools (cold and hot water), and some Jacuzzi lounging. Rent a sunbed and umbrella, or just hang out at the spa cafe. Totally soaked out? Finish off the day with ice cream on Saturnia's lovely piazza (it's the name of the nearby small town too) or with a thorough two-fold Michelin star meal at Da Caino in Montemerano. For more info about rock pools and thermal baths, check my map of Tuscany's best natural springs and historic spa towns. Hold on, slippery ground. But fun for old and young alike!